Samsung Electronics has sought a ban on the import and sales of some Ericsson products in the US which it claims infringe its patents. In a complaint filed with the US International Trade Commission (ITC), Samsung has accused Ericsson of breaching seven of its patents. The move counters Ericsson's complaint to the ITC, made in November, seeking a sales ban on some Samsung products. Ericsson has also claimed that Samsung infringed some of its patents. The Swedish firm had a licensing deal with Samsung under which the South Korean manufacturer was allowed to use various technologies patented by Ericsson in its products. However, the two firms have failed to renew the agreement, despite negotiating for almost two years. Ericsson has claimed that Samsung wants to reduce the fee it pays to license the said patents, while Samsung has argued that the fee demanded by Ericsson is too high. "We have sought to negotiate with Ericsson in good faith. However, Ericsson has proven unwilling to continue such negotiations by making unreasonable claims, which it is now trying to enforce in court," Samsung said in a statement. "Under such circumstances, we have no choice but to take the steps necessary to protect our company." Ericsson is one of the earliest innovators in the telecommunications field and holds thousands of patents for technologies used in everyday global communication. Some of these technologies are key to products made by other manufacturers such as Samsung. Companies which hold patents to such essential technologies enter licensing agreements with other manufacturers allowing them the use of patents under fair, reasonable and non-discriminatory conditions. Firms pay royalties to the patent holder to use the technology. 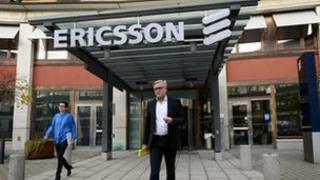 Ericsson earned $938m (£585m) last year in revenue from more than 100 licence agreements with companies in the industry. However, stiff competition has lead to a much more protective stance by many companies over their patents in order to generate revenues. Earlier this month, European Union competition regulators accused Samsung of abusing its position of holding key patents, while trying to negotiate royalty rates with rival Apple. Meanwhile, Nokia and Apple have also taken rivals to court over patent infringement.